Commuters in Miami-Dade dealt with a messy Monday morning commute after an overturned tractor trailer caused major backups getting onto I-95. Florida Highway Patrol says the driver of a the tractor trailer took the 826-EB ramp onto I-95 too fast just before 3 a.m., flipping over and ending up across the roadway. The driver of the truck along with two passengers were not injured. The driver was cited for the crash, according to FHP. Motorists are advised to take alternate routes wherever possible, as the Turnpike southbound ramp as well as the 826 eastbound ramp onto I-95 are closed. Drivers can use US-441, Northwest 27th Avenue or Miami Gardens Drive as alternates. 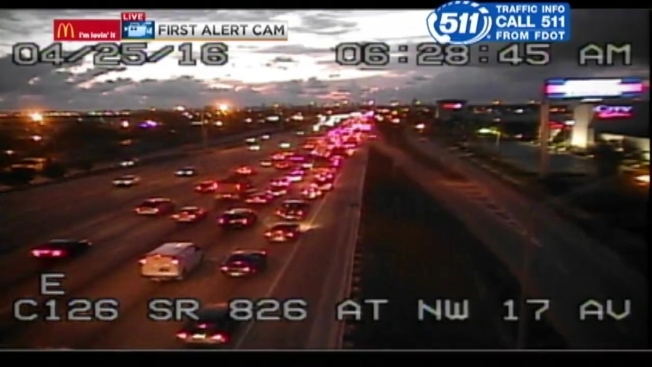 Stay with NBC 6 for updates and follow traffic reporter Kelly Blanco on Twitter for the latest updates and information.